Rajesh Sir, IMD says that it is unlikely that the SWM will withdraw from NW India before one week is past. What are your thoughts regarding this? 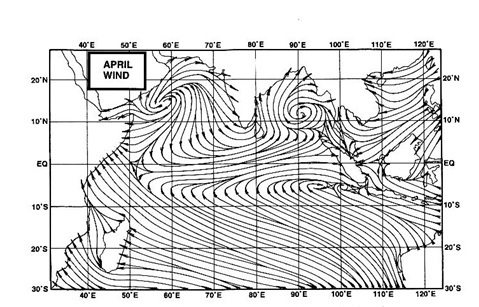 Are the parameters necessary for SWM withdrawal gonna shape up in the coming days? Tejas Abhijit Rohit and shivkumar because of your excellent work we have readymade data and maps at our fingertips. Great work. As shared by Rajesh sir MAHA toppers figures in bracket are 2016 taken from vagaries blogs. 2016 Ghats had outstanding rains but 2017 is also close by...with GUJ/RAJ setting new records! KAR Agumbe is left far behind struggling to reach 5000mm. September is rainiest month for KAR hope things will be better for Cauvery catchment areas. Rains in Bangalore started on Gokulasthami night - Aug 14th.....Its still continuing. From Gokulasthami to Ganesha..now seems like would go into Navrathri. South , South West , South East , CDB area's over 80 cms for the year. Normal is 97 cms. On Aug 14 evening most area's were at 43 cms to 47 cms. So almost 37 to 40 cms rain in 18 days. I think these are the last rains for Delhi.with heaviest 24hrs rains so far being only 68.mm. Monsoon will withdraw soon and hot n dry weather will take over the capital . 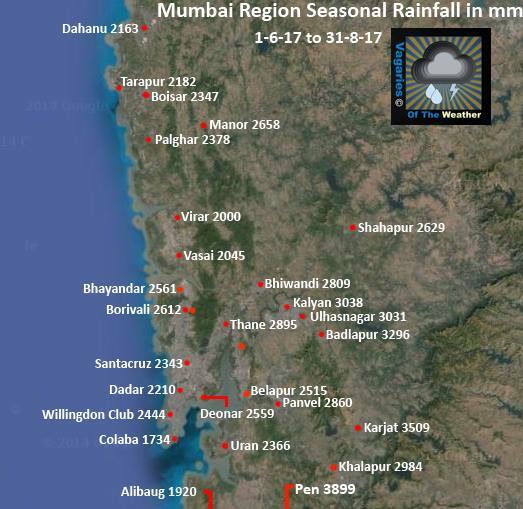 Sorry bracket figures are from 01/june/2016 - 01/oct/2016 (from vagaries blog), this implies 2017 MAHA rains may be at par with 2016 MAHA rains! Sept may see some more rains. @sset Shirgaon (Chiplun) and shirgaon ghat are both different places. Last year Shirgaon (Chiplun) received 9293 mm not Shirgaon ghat. Good to see "Rally for rivers" - started by Isha foundation in Tamil Nadu. TN is most driest state of India- 80% dependency on NEM (highly unpredictable). Rally mandates compulsory tree plantation of native species across river course (benefit farmers)- this is good move to revive Cauvery over Kodagu basin (which is encountering less rains every monsoon) - rally may serve seed for river linking by PM Modi. It seems Tamil Nadu has had some excellent rains last 24 hours spread across from Chennai to Coimbatore to Madurai ranging from 50 to more than 100 mm. I repeat that this has been a wonderful SW Monsoon covering most regions. There are still some exceptions to this as there would always be anywhere. Absolutely a delightful monsoon overall. This has been the best August for TN rain in the last 50 years as per this report. And then we have someone saying here "TN is the most driest state in India....." !!!! About 40 years back in school I was taught that Rajasthan and Leh are the driest regions in India. Rajesh, need your help here to know if I need to take geography lessons again ! !Or as always, I take it as Saturday fiction reading material. Any further updates regarding the status of SWM's exit from NW India?